Plants and animals use color in a variety of ways. Some animals use color to camouflage, or blend into, their environment. Other animals may have bright colors to attract a mate or as warning colors to tell predators that they are toxic or taste bad. Plants are green due to chlorophyll, the chemical that helps them change sunlight, water and air into sugar and oxygen. Plants may also have brightly colored or patterned flowers to attract pollinators. What animals have the craziest camouflage? Make Six Shares representing six different colors. These photos must capture living things found in nature, but you can reuse photos you’ve already submitted throughout the different ecoEXPLORE Field Seasons. Include “color badge” in the comment section when you submit each share. 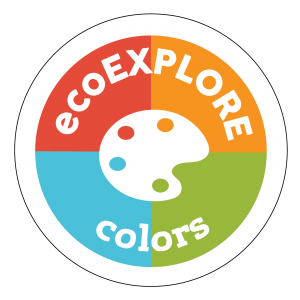 In addition to earning your Colors Badge at least one of your photos will be printed and displayed in a special student photography exhibit in The North Carolina Arboretum’s Exhibit Greenhouse as part of the Arboretum’s Covered in Color summer celebration from May through August 2019. All participants will also be invited to a reception to kick off the exhibit on Thursday, May 30th. In order to earn your Colors Badge and have your photos displayed all requirements for the badge must be completed by March 1st. Jenna Marie Kesgen grew up in the Smoky Mountains of Western North Carolina. From spending many hours exploring the woods as a child, she has developed a deep love and appreciation for nature. She has used this passion as inspiration for her artwork. Over the past fifteen years, Jenna has lived in many places around the world, including Spain, Ecuador, New Orleans, New York, and Oregon. Throughout her travels, she has documented the many beautiful places, flora, and fauna that she has come across through her paintings. Some of her artistic accomplishments include a Best in Show in the art gallery competition entitled “Bridges” at Gallery 364 in Bay Ridge, Brooklyn in August of 2007. She has contributed to many art markets, including the Bywater Art Market in New Orleans, LA. She also painted the four wall mural displayed at the North Mountain Park Nature Center in Ashland, Oregon. 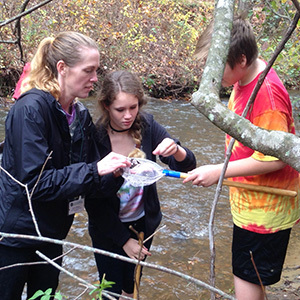 Jenna Marie Kesgen now lives in Asheville, North Carolina and works at The North Carolina Arboretum as an Environmental Educator and Interpretation Specialist. Jenna is serving as our Creativity in Nature Mentor.